Recently I was asked by a large system integrator about Adobe’s standpoint on the Business Process Modelling Notation (BMPN) specification. Not many people know that Adobe participates in quite some industry standards and supports their maturity/evolution such as BPMN, BPEL, BPDM and XPDL and that we are voting members of standard bodies such as OMG, OASIS and WFMC. Adobe is represented in all these standards bodies and actively participates in reviewing and authoring of these standards. We take a lot of that knowledge back into the decisions we make when developing our enterprise products, especially Adobe’s LiveCycle Enterprise Suite. A graphical notation. E.g. How different activities are represented in a process diagram. Semantics of the graphical notation. E.g. What does it mean when you connect activities with a line. The primary goal of BPMN is to provide a standard notation that is readily understandable by all business stakeholders. These business stakeholders include the business analysts who create and refine the processes, the technical developers responsible for implementing the processes, and the business managers who monitor and manage the processes. Consequently BPMN is intended to serve as common language to bridge the communication gap that frequently occurs between business process design and implementation. 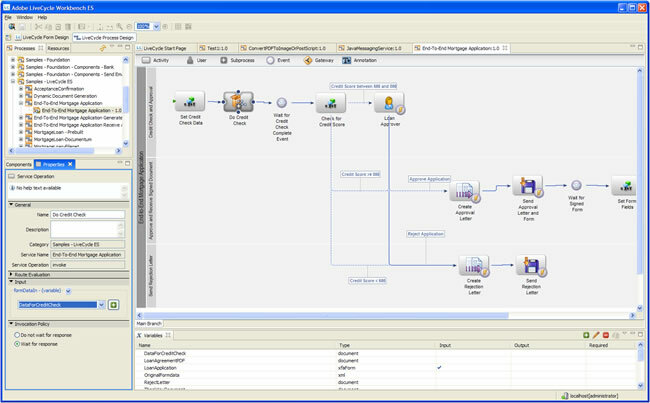 Using the Process perspective in LiveCycle Workbench, one can visually create process maps that define and control your automated business processes. 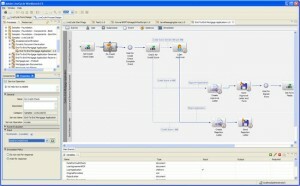 Since Workbench implements the main constructs for the graphical notation and the semantics of that notation as specified by BPMN, business analysts can create process diagrams using swimlanes, activities, events and associations following common modeling methodologies (we still have a gap to cover when it comes to modeling of Gateways). To summarize: if you have been trained in BPMN, you will find it easy to model a process using LiveCycle Workbench. ps: One should know that the current BPMN spec (v1.1) does not specify how a process diagram should be persisted by a modeling tool. There is no XML schema for example. However, there is another specification – XDPL – which does provide this and the BPMN v2 specification currently in review also has a defined schema for persistence. Since standards have not been defined or widely accepted, LiveCycle Workbench currently persist that process definition using custom XML for which Adobe has publish the XML Schema (which after installation can be found under the LiveCycle SDK/schema directory).